Rotisserie: World leaders in the manufacture of rotisserie in electric or gas. 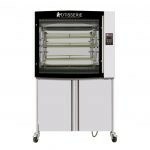 Rotisol’s full range of rotisseries from luxury models for hotels and restaurants, supermarket models, market models and small retailers. From 6 to 64 chickens. With optional accessories and various configuration options.